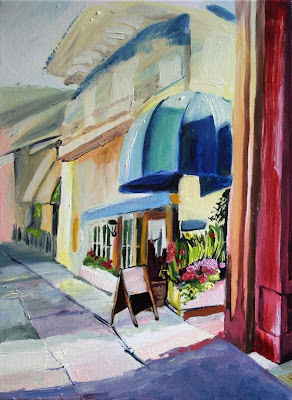 "La Vie en Rose", San Anselmo Inn in the afternoon light, plein air painted outside the Inn, 12" x 16", o/c. 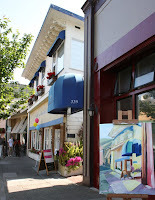 This painting was started yesterday, at my first Marin Open Studio at the San Anselmo Inn. It was a warm, summer-like day in town,and there were lots of loquacious and lively visitors. My favorites were of course, the two Norwich(? )terriers, and their incredibly, happy owners. 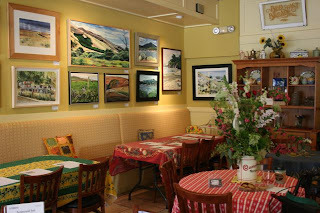 My work will be at the Inn most of the summer, along with fellow artist, Kate Peper, who does watercolors of Marin County scenes. 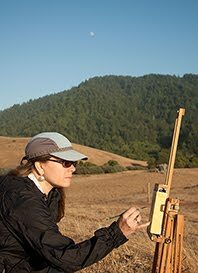 Kate and I are both participating in this year's, Art on the Farm series, in which we paint at local, Marin Organic farms with other artists, and give back 50% to Marin Organic. Our show at the San Anselmo Inn is being run as a silent auction for two months(May - July 1), with 20% going back to San Anselmo business. 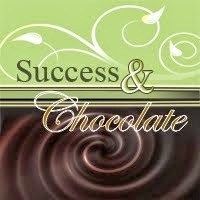 Stop in and bid on a piece of art, and you may take it home in a couple months at a greatly discounted price. My prints and notecard sets are also available at the Inn for purchase.